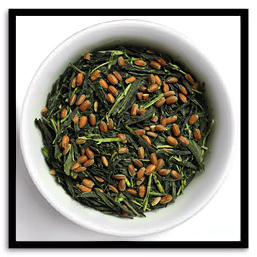 One of the most popular teas in Japan, Genmaicha (brown rice tea) is a special blend of imported green tea leaves and locally grown and oven-roasted brown rice. The result is a rich and savory infusion that drinks well throughout the day - on its own or served along with food. 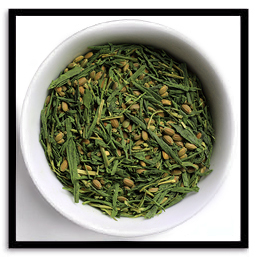 PREPARATION: Infuse Genmaicha with water heated to 176°F (80°C) for one minute and serve. Reinfuse by increasing the water temperature and steeping time. Our own blend of Japanese green tea, ceremonial-grade matcha and brown rice grown and roasted in the Pacific Northwest. The addition of matcha to leaf-tea enables you to enjoy the flavor without whisking. It also turns the infusion a beautiful shade of green. PREPARATION: Infuse Genmaicha+Matcha with water heated to 158°F (70°C) for two minutes and serve. Reinfuse by increasing the water temperature and steeping time.